Prayers to Start the Week followed by a potluck supper. Our theme this month is "Primavera Potluck". There is always plenty to share, so don’t worry if you’ve no time to shop or cook. Join us anytime! Catholic Liturgy. A Healing Rite will also be held at this service. We will be having a Memorial Day picnic following the service. More details about the event and location will be posted soon. 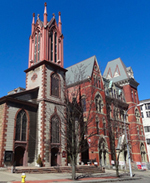 We meet at St. Luke and St. Simon Cyrene Church, located at 17 South Fitzhugh Street at the corner of Broad Street in downtown Rochester. Parking is free in the lot next to the church unless there's an event at the Blue Cross Arena. On-street parking is free on weekends. Although independent of "2-Saints," we maintain a special relationship with this church and its members, supporting each other in ministry and often celebrating special events together. A coffee hour follows each of our worship services. If you want a change in your Sunday morning routine, or if you just want to sleep in and catch a later service, then come to the D-I Episcopal Eucharist service at 5 pm on the first Sunday of every month. We have an impressive list of Episcopal priests from the Rochester area who serve as presiders and homilists for us. Afterwards, there is a coffee hour social starting around 6:15 pm. On the second Sunday, our Liturgy of the Word is in the Roman Catholic tradition, and it is led by a layperson who has studied theology or has other suitable qualifications. The service has many of the elements of a Mass, with a few extra features thrown in, but no communion. Nevertheless, it does fulfill your Sunday obligation, and it's based on the Roman Catholic guidelines for Sunday celebrations in the absence of a priest. The presiders and homilists are people who would undoubtedly make great priests if the Roman Catholic church was fully open to the gifts of women and married men. Following the service, there is a coffee hour social starting around 6:15 PM. For a sample of this Liturgy of the Word (including our prophetic "Liturgy of the Stones"), visit the liturgical resource site STICKS & STONES / FLESH & BLOOD: Liturgical images and movements that speak to experience at www.mjnicosia.webs.com. On the third Sunday, there is either a quiet Episcopal Eucharist (I.e. without music) or a Catholic Liturgy (with or without music) at 5 pm. Following the service, join us for a coffee hour social starting approximately 6:15 pm. A short prayer service is held followed by a potluck dinner. On the fifth Sunday, there is a Catholic Liturgy (with or without music) at 5 pm. Following the service, join us for a coffee hour social starting approximately 6:15 pm.